Hard drives are one of the pillars of modern technology. Western Digital Owns HGST. HGST Tops as Reliable Brand as Cloud Storage Hard Drive. Previously, we talked about the pathetic no advantage of SSD as hard drive for cloud storage. More than a year ago, we talked about the reports of tracking the reliability of hard disks used to offer storage solutions and online backup services. In the studies conducted in 2013 and 2014, HGST; which is now owned by Western Digital and formerly known as Hitachi was listed as the manufacturer who can manufacturer the components with the highest reliability index. On the other hand, the Seagate products, while offering superior performance in comparison to the competitors, had proved the most prone to malfunction and hardware failure, with worrisome percentages (over 30%) for the 3TB hard drive – the analysis was naturally criticized harshly by the Seagate summits. First of all we should cite some data. The sample taken into account by BackBlaze only in Q1 of 2016 amounted to 61590 units. As for the hours accumulated by the hard disk total service provider (since the start of the measurements), it has reached the threshold of one billion hours – approximately 42 million days. As also anticipated by the title, HGST continues to be the most reliable manufacturer : 3TB and 4TB units, after about three years of service, were respectively of remained of expected condition. 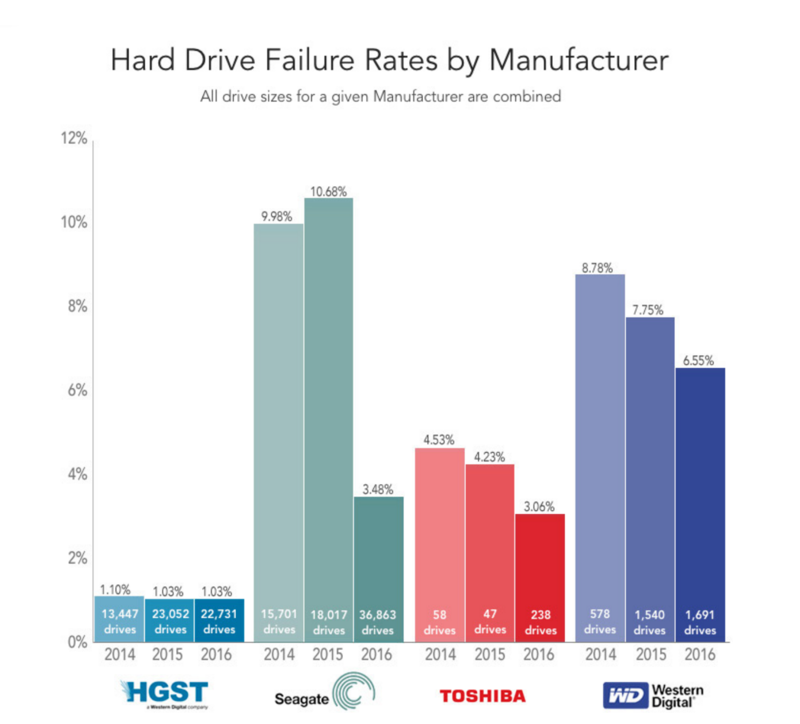 Seagate, although it remains among the manufacturers with the highest rates of failure, still left behind the very encouraging results of the 3TB units of 2014. This Article Has Been Shared 2583 Times! Application Service Provider or ASP is a service of an application for exchanging information over a public network and is used over PaaS now as SaaS. Data on Cloud has some unclear spots like in case when the provider operate not under same nations law, but law of a foreign jurisdiction, that can add issues. In any case, the turn to cloud for medium to small business means a change in the operating models. But what are the necessary steps to achieve that? Cite this article as: Abhishek Ghosh, "Cloud Storage Hard Drive : HGST Tops as Reliable Brand," in The Customize Windows, May 23, 2016, April 21, 2019, https://thecustomizewindows.com/2016/05/cloud-storage-hard-drive-hgst-tops-as-reliable-brand/.